Since the day I arrived in Mumbai, I have been fascinated by the marigold garlands that you see absolutely everywhere. The bright colours - white, yellow and orange are so cheery that I have bought a few from our local market to hang in the apartment. It was only when I recently visited a Hindu temple, that I came to realise that these marigold adornments are not really designed for sprucing up one's home. In fact, marigolds have a huge spiritual significance - hence why they are found hanging in religious places, from doorways, on the fronts of all modes of transport, outside restaurants, at Hindu weddings etc etc. before they are wilted by heat and humidity (not always successful). The English name 'marigold' (also known as Calendula) is derived from the Christian name for the flower being "Mary's Gold". As with many things in India (including chilli! 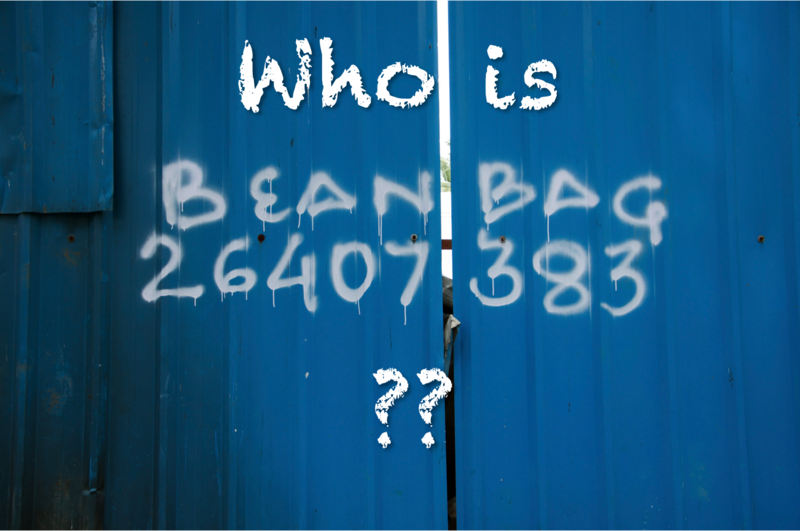 ), the plant was introduced by Portuguese colonists. Flower garlands are a staple in Indian traditions as they are considered so pure. People offer them as a sign of honour and respect. They also offer them to honour Indian gods and goddesses (particularly Laxmi and Ganesh) and to welcome visitors. Although I have also seen them at most Christian altars in and around Bandra. Traditional flower garlands are made of orange and yellow marigold flowers together with scented white jasmines - with the flowers being weaved into a garland using thread and then knotting in the ends. The garlands that I buy, which are about two foot long when extended cost about 40 or 50 rupees (£0.50). 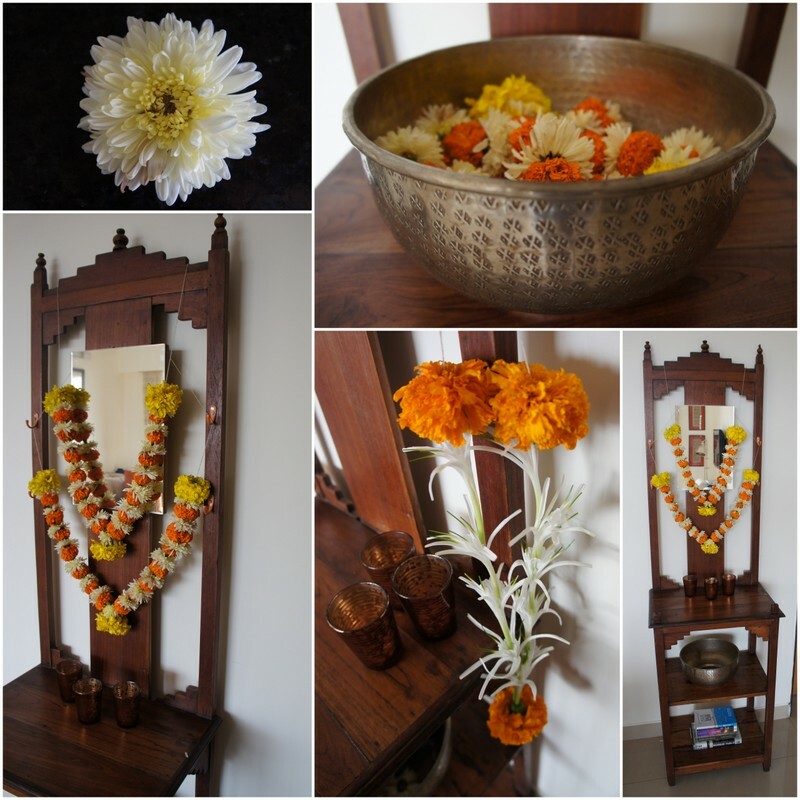 How I like to use marigold garlands in our home - hanging them off the hall stand and placing them in a large silver bowl. In Indian life, colours always hold an especial importance which makes the displaying of marigolds even more significant. White is widely accepted as the color of peace and purity. Yellow symbolizes sanctity. Saffron, a soft orange color, is considered an auspicious and sacred color and orange represents courage and sacrifice (hence why it is one of the colours of the Indian flag). I have to admit, orange was a colour I shunned in the UK - perhaps because it does not suit our wintery grey light. But I have totally fallen in love with it here in Bombay. The colour orange is now what makes up all the accents in our sitting room - a perfect hue against the bright Indian sunlight. I have also been to the flower 'galli' near Mumba Devi Temple in South Mumbai where they make up the garlands from huge baskets of marigold flowers. I love all the different colour/flower combos with each seller having their own signature design. And the colours are so fresh and so vibrant, you almost want to eat them! Flower Galli near Mumba Devi Temple - making it easy for buyers to snap up a garland offering on the way to worship. I thought this one was a real stunner! Made up with white marigolds, jasmines and deep magenta rose petals. I wish it wasn't so dark in the flower galli - these colour combinations do not look so vibrant as they really are. Most of these garland vendors will buy their flowers very (very!) early in the morning from Dadar flower market: Bombay's largest wholesale flower market. I will update you further when I have visited it to take even more photos of marigolds! Awesome! Truly beautiful post regarding to Indian tradition & culture.Marigold flowers are the most demanding exotic flowers in India as they are consider very importantant & auspicious in every sphere of Indian Culture along with Lotus. Thanks for sharing. Our forthcoming Ambassador car rally!